A couple of weeks ago, I heard about a new book coming out by a mom who climbs mountains with her young girls. I was intrigued, and clicked over to her site to read more. I was so moved by their stories, and I knew I had to get the book and interview this mom. 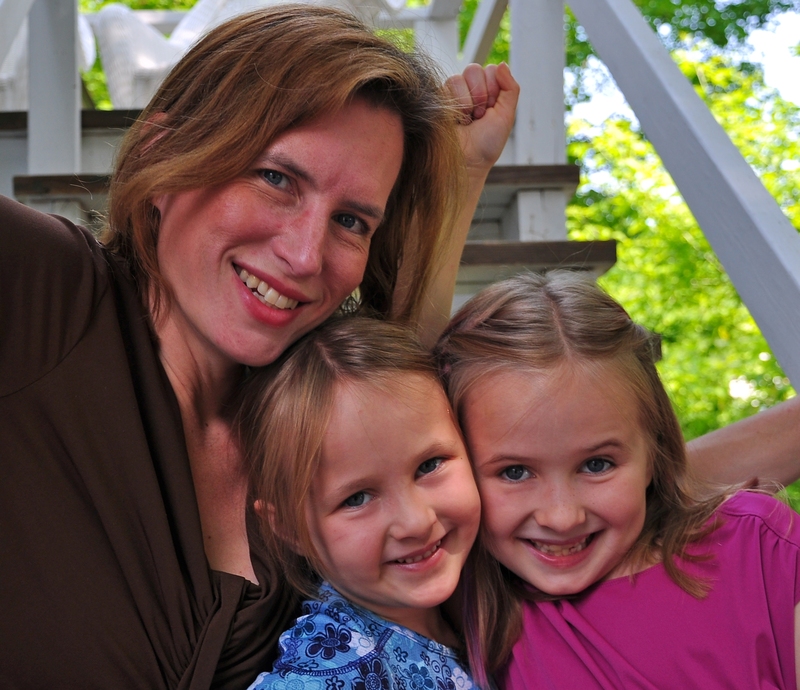 Patricia Ellis Herr began climbing mountains with her daughters when her oldest, Alex, was 5. Her book, Up: A Mother and Daughter’s Peakbagging Adventure tells how they began and where their decision to hike led them. She presents the story of their quest to summit New Hampshire’s 48 tallest mountains as a series of life lessons they learn along the way. She tells of exhilarating highs and lows, scary moments and dangerous weather, mistakes and victories. They have crazy wildlife encounters and unsettling human encounters. Trish is honest about their struggles and mistakes, and gives good advice for other hiking parents and kids. One of the lessons Patricia Herr talks about is “Ignore the Naysayers,” as she met several people in person and online who loudly questioned her and Alex’s abilities to climb 4000+ foot peaks. I really appreciated the way she dealt with the issue of sexism and gender bias with her young daughter. I felt sad that Alex had to face such overt bias at such a young age, but was impressed with how both mom and daughter handled the situation. Similarly, Trish had to learn to “Mother Up” when they encountered an insane grouse on the trail. Even mothers have to dig deep to find the courage to deal with what life throws at us. And I have wondered myself if I am out of my mind on some of our adventures, so I appreciated her addressing this question in the Introduction. She addresses dealing with risks, being prepared, and having caution while carrying the weight of the shadow of her husband’s serious climbing accident in his youth. 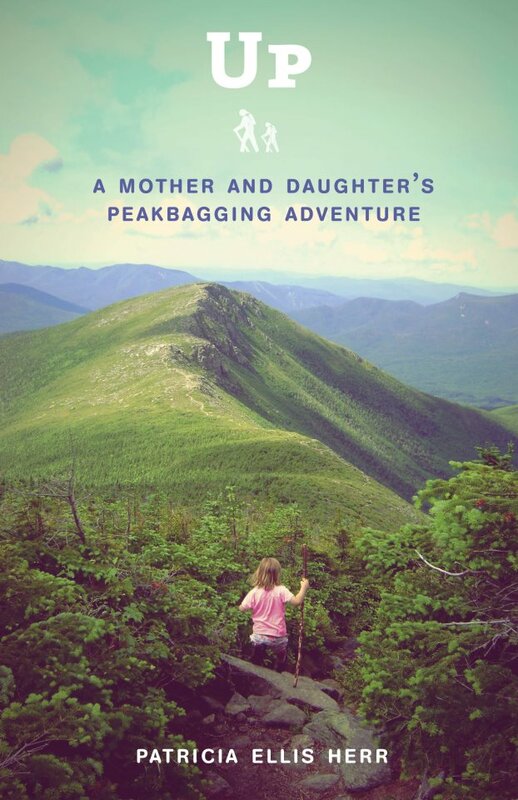 Reading Up: A Mother and Daughter’s Peakbagging Adventure by Patricia Ellis Herr brought up many thoughts and emotions for me. I read this book almost straight through, with only a few breaks to process what I was thinking and feed my hungry children. Trish is descriptive of the trails they hike, the vistas, the weather, their emotions. As a hiker mama, I can truly picture the scenes she describes. But anyone will be able to relate to their journey, I believe, whether they hike or not. Alex and her younger sister, Sage, have both gone on to climb more mountains, and I look forward to seeing where they go from here. But that’s enough from me; let’s hear from the author herself, Patricia Ellis Herr. The Hiker Mama: In the book, your first hike seemed like it was kind of on a whim. Had you hiked with your kids before this point? Did you hike much before they were born? Patricia Herr: Before embarking on the 4K quest, the girls and I had not hiked in terms of backpacks and boots. We had, however, taken numerous long walks in the fields and paths of Concord, MA. Two of our favorites places were Drumlin Farm and Walden Pond. We’d spend hours in these two locations wandering about and examining plants, ants, bees, water, etc. I didn’t officially hike before the girls were born, but I did take insanely long walks from time to time. When I lived in Chicago in my 20s, I would walk from the downtown “Loop” to Evanston and back. While in Cambridge, MA for grad school, I’d walk from the main Harvard campus to the Med School in Boston…and back. So, though I didn’t don a backpack until I started hiking 4Ks with Alex, I’ve always been a long-distance walker. HM:One of the big challenges I face as a hiking mama is finding other people to come with me and the kids on our adventures. How do you find hiking partners on those occasions when you want other folks with you? Do you have any advice for parents wanting to find a network of partners? PH: The girls and I are usually on our own when we hike 4Ks. Sometimes we’re with other adult hiking friends who consider the girls their peers, but we’re almost never with other kids. We know of only two other families whose kids enthusiastically hike 4Ks. We’ve been fortunate to share trail time with these two families on a few occasions, but busy schedules prevent us from hiking together as often as we’d like. Finding partners can be difficult, and you have to be careful how you advertise for them. It can be dangerous to tell the world what your plans are when your hiking partner is a very young child. I got to know the few people we hike with by attending a few publicized hiker gatherings. Therefore, I’d say look for family camping meet-ups and search your local Yahoo groups, etc. Find folks who either hike with their kids or who don’t mind hiking with other people’s kids. The process might take some time, but rest assured, there are people out there who will want to hike with you and your family. It might take some time to find them, but they’re out there. HM: I’m always curious about gear. I was keenly interested in your descriptions of what went in your bulging pack, as I have spent some time under the weight of a large pack, too. Some friends have given me a hard time about how I carried everything but the kitchen sink. Can you tell me what you and the girls like to wear while hiking? PH: We wear layers. First, base layers — nothing cotton, usually synthetic fibers, designed to wick sweat and water away from the body. Next, fleece. On top of that, waterproof/windproof shells. We wear or carry these layers on every single hike during every single season, and we always pack changes of base layers and fleece. The Whites have some of the fiercest and most unpredictable weather in the United States. There have been many times when we’ve had to wear full winter gear (minus facemasks) while hiking above treeline in the middle of the summer. HM: Do you have a favorite gear resource (where you buy your gear) for your children or yourself? Where do you get child-sized hiking clothes? Do you have a favorite piece of gear? Do Alex and Sage have favorite gear they wouldn’t do without? PH: Lahouts. There’s a location in Lincoln, NH that usually carries base layers and hiking boots in children’s sizes. I’ve been able to get all the right hiking layers for both girls at Lahouts, even when Alex was five and Sage was three. As for my favorite piece of gear — emergency whistles. Those small, orange, plastic ones that can be heard over gale-force winds. If you read Lesson One of UP, you’ll understand why. The girls’ favorite gear are headlamps. They each like having their own. HM: Your husband Hugh seems so supportive in the book. How does he feel when you and the girls go off on big adventures? PH: He’s admitted to being worried once or twice. He doesn’t know the trails, since he rarely hikes with us, so there are times when his imagination takes over in a negative way. He usually doesn’t fret, though. He knows I’ll activate my Personal Locator Beacon (PLB) if I run into serious trouble, and he knows I carry camping gear in case we have to spend an accidental night out. HM: I am often out adventuring while my husband stays home, and am curious what you do to keep yourself and your girls safe on the trail. Can you describe what measures you take to mitigate risk? What do you bring with you for safety? PH: I carry enough gear to keep me and my daughter(s) warm, dry, and fed for at least one accidental night out. This means I have a bivy, tarp, sleeping bag (or two), ground mat(s), extra food, chemical hand and body warmers, and multiple layers of clothing on each and every hike, no matter what the season. I also carry a cell phone and a Personal Locator Beacon (PLB). As far as safety against animals and people, I carry pepper spray and a few other things I can (legally) use as weapons. That being said, I’ve never felt at risk from another human being while hiking in the Whites. HM: Do you ever get creeped out at night while out with the girls? If so, how do you deal with it in the moment? PH: Nothing makes the girls and I hike faster than realizing that the sun is going down and we are still three miles from the trailhead! We have hiked out in the dark (using headlamps) at least half a dozen times. The worst part is the anticipation — once night has actually fallen and the headlamps are turned on, you realize there’s nothing to worry about. Once, Alex and I walked four miles to the car under the light of a brilliant, full moon. We didn’t even need our headlamps, it was like there was a giant flashlight hanging from the sky. The woods were gorgeous that evening! Still, whenever possible, we prefer to finish our hikes before sunset. HM: In your book, you describe a few trips where you had to turn around before reaching the summit. Can you elaborate on how you make decisions about whether to turn around or continue on? PH: We’ve only had to turn back three times. Once, the wind speeds became excessive. Another time, Sage felt sick and wanted to go home. Alex once asked to turn back because the trail conditions were making the hike extremely difficult that day. HM: One of the things I couldn’t relate to is the lack of whining from your children! I know that some of that is their personality and their personal drive to achieve their goals, but I also know there were times where you mentioned how you needed to help them gain perspective or work through disappointments or fatigue on the trail. Can you tell me more about the games you and your girls play while hiking to pass the time and miles and keep their spirits up? The Name Game — each person lists all the things she can think of that start with each letter of her first name. Making Sentences — each person says one word, then everyone makes sentences using the all the words given. Riddles and Jokes — each person tells a riddle or a joke (does not have to make sense). HM: Do you have any rules of thumb for how often to rest while on long dayhikes? PH: We have no rules of thumb. When they feel like resting, we rest. HM: What do you bring to eat on the trail? What are your lunches and snacks? What do you bring when you are doing overnight hikes? PH: We’re classical, with a secular, Charlotte Mason bent. The girls do a lot of subjects every day, but in short sessions. An average day looks something like this: each girl does math, reading, handwriting, biology, chemistry, Mandarin (Sage), Spanish and Latin (Alex), spelling, world history, American history, and grammar. There’s usually a playdate or an extracurricular class as well. HM: You describe Alex as having an amazing amount of energy. Does this exuberance make it difficult to homeschool at times? Do you find your time in nature helps her in her school work at all? OR – did you notice any benefits (for you or your girls) of your abundant time in nature once you started your quest? PH: Alex calmed down after we began hiking in earnest. She’s never had a problem with learning, so I can’t comment on whether or not nature has helped her with her schoolwork. It has definitely produced a more serene spirit, though. It’s as though before she started to hike, her emotions and energy sometimes got the best of her and she seemed almost manic. Once we began hiking, she became happier and calmer. HM: How did your peakbagging quest fit into your homeschooling schedule? Do you attempt to tie your time in nature to your curriculum or learning while at home? PH: We’d homeschool if we didn’t hike/peakbag and we’d hike/peakbag if we didn’t homeschool. We don’t do one for the sake of the other. All the hikes in UP were done on weekends, and most of our hiking nowadays is still on the weekends. Therefore, even if the kids went to traditional school, we’d still hike/peakbag. I don’t try to tie in our hikes with planned schoolwork. I want the kids to enjoy the moment while in nature. There are times when the girls want to be quizzed on a certain subject while they’re hiking, though. It’s their way of thinking of something else while ascending particularly steep sections. Other than that, we leave the schoolwork at home. HM: Some hikers talk about having a special trail or location they like to go to over and over, because it brings back special memories or helps them through difficult times. Do you or Alex or Sage have any trails you like to return to, or special places in nature you go when you are feeling down? PH: We like this tiny little “mountain” called Bald Mountain in Franconia Notch, NH. It’s a fast and easy climb with a few fun rock scrambles. Since the summit is only a fourth of a mile from the parking lot, we often go there when we want to enjoy nature but we don’t have much time to hike. HM: How do you handle the competing demands of motherhood, housework, homeschooling, writing, and all the work (and joy!) of publishing a book? PH: Caffeine! I drink way too much caffeine. As a homeschooling mom, my daytime hours are dedicated to working with my kids and taking them to playdates, extracurricular classes, museums, etc. I’m able to keep up with emails and social media here and there throughout the day, but the bulk of my writing is done at night, after everyone’s asleep. I’m usually up until 1:30 or 2 in the morning. As for housework…that doesn’t get done as often as it should, but everything’s “clean enough.” My house will never win awards, but the dishes and clothes are clean, everyone’s fed, and most of the stuff is where it’s supposed to be. That’s as good as it’s going to get. HM: Have you been able to continue to have adventures during all the excitement of your book release? PH: We took a break from hiking after Alex finished the winter 4Ks (the Four Thousand Footers hiked strictly during calendar winters) on March 17, 2012. I spent so much of last winter constantly worrying about the weekly forecasts! Winter hiking in the Whites is a completely different game, it requires so much more diligence and caution. I lost a lot of sleep worrying about all the what ifs. When Alex and I tagged our 48th winter peak, I told her I needed a few weeks off to relax. Those few weeks are almost over, so Sage, Alex and I will be back on the trails very soon. HM: By the map on your website, it looks as if you’ve reached at least half the state highpoints in the country. What are your plans for continuing on that quest? Do you have other goals you are reaching for, as well? PH: We’ll head west every summer and see what we can do with the remaining highpoints. Here in New Hampshire, we plan to explore a wide variety of trails and peaks. HM: Do you plan to come out to Washington State? We’d love to show you around! I am so thankful to Trish for taking the time to answer all of my questions. I recommend her book wholeheartedly, even if you aren’t planning on doing peak bagging with your children. Anyone can learn from the lessons Trish talks about. There is a saying in the hiking community, “Hike your own hike.” In other words, everyone has a different way of hiking. We have different goals and purposes. The last thing I want is for anyone reading this to feel inferior about what they do with their kids. (I have another post planned on that topic in the near future.) But getting your kids – and yourself! – out into nature is so important! It doesn’t really matter what your goals are, as long as you get yourself out of the house and into the fresh air. You can follow Trish by going to her website, http://www.trishalexsage.com, as well as finding her on Facebook and Twitter. And let me know in the comments what you think about the book. I’d love to hear your thoughts! Patricia Ellis Herr sounds like an amazing woman. Thank you for sharing your discovery of her with the rest of us. Thanks for this follow up with her Jenn. I was curious about Hugh, since there is no mention of him in book blurbs or her video. Could I gain more insight into their relationship if I actually read the book? Hi Alexei! Yes, there is a whole gut-wrenching chapter where Hugh has to tell the girls about his accident. Most of the book is about Trish and Alex, but the rest of the family does figure into the story. I think you’d like the book a lot. I don’t know how much I should say without telling Trish’s story; I can’t remember how much she has on the blog. Wow, thanks Jennifer! I see of lot of YOU and your kids in her and her kids (does that make sense?). Thank you for your informative book review and the fascinating interview. Looks like I have another book to add to my reading list!